The Gravity Flow Checklists Extension v1.0-beta-2 is now available via auto-update and for download from the account area. This a major release that contains some frequently requested features along with some bug fixes. Gravity Flow administrators can now mark forms as exempt for selected users. Once exempt from submitting a form, the user will be able to submit the next form in the checklist sequence. It’s now possible to block the checklist sequence until the workflow for a form is complete. 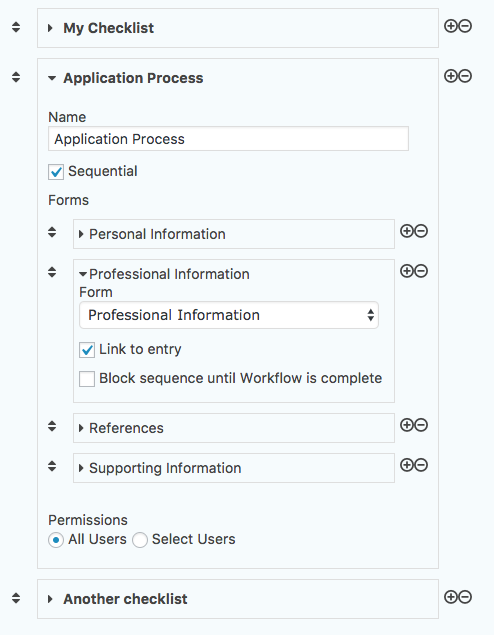 Enable the “block sequence until workflow complete” setting in the checklist configuration. Don’t want to link to the the entry? Deactivate the new setting “Link to Entry” in the Checklist settings. Added settings to each form in the checklist configuration to allow the checklist sequence to be blocked until the workflow is complete. Added form exemptions. The admin can now mark forms as exempt for selected user. Added settings to each form in the checklist configuration to control whether the form title is linked to the completed entry. Added the gravityflowchecklists_entry_url and gravityflowchecklists_form_url filters. Fixed an issue with the link to the checklist list page from the breadcrumbs where the id parameter is not removed.